Now, I don’t know how many temples we’re likely to be decorating, but there’s plenty of uses for this art in the here and now. The most immediate though that came to mind was sand art. While you can buy various sand art kits, it’s just as simple to make your own materials. Namely, coloring the sand. I figured if I can tint sugar with food coloring, I should be able to do the same for sand! 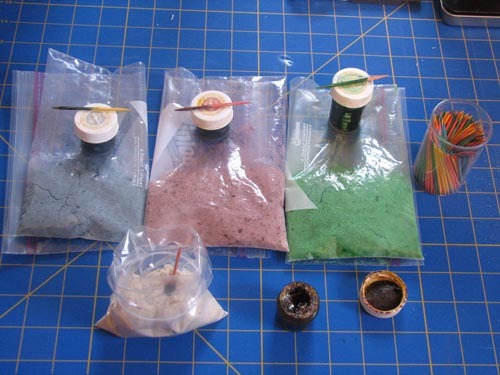 Pour a bit of sand into your baggie and add a toothpick’s glop of color to it. Seal the baggie but do not squeeze out all of the air–leaving a little in there will allow the sand to move around a bit and make mixing easier. Smush the sand and color around inside the baggie until the color is fully distributed. If you do choose to use a liquid coloring agent you may need to try out the sand a bit. Spread it out on a foil-lined pan and place in a low oven until dried out. Very find sand will always feel a little damp but will make pretty pictures just as well as larger, coarser sand. *As a former Wilton Istructor, I am partial to their icing colors . The pastes are concentrated colors and last forever–the ones in the picture I’ve had for 10 years and they still work great! What a fun idea! Hello for Lady Bloggers Society. Come say ‘hello’ when you can.